The Service Automation Framework is centered around the User. In order to make effective and valuable services, a first step an organization therefore needs to take is to understand its Users. Who are they and what do they like? Although this sounds very simple, it is a step that is frequently overlooked by service providers. If an organization understands its Users, it becomes possible to design an optimal User Experience (UX). In the first block of the Service Automation Framework, the objective is to understand the User. Service providers of automated services frequently deliver services to large groups of homogenous Users. Therefore, it is important to determine uniform User Groups and User Characteristics. Automated services need to be fully automated. Therefore, it is required to exactly understand User Actions so that they can be turned into scripts. Determining the User Groups of services is a valuable exercise. It will provide insight in the types of users that a service provider currently has and, more importantly, the types of User a service provider aspires to have. A detailed description of User Groups will give clear and valuable input to the Service Design phase of Service Automation. Knowing the User is the first step to achieving an optimal Users Experience. Information availability and content. The availability and depth of information are frequently key elements in the way services are perceived. Limited or wrong information makes us question the trustworthiness of any service provider, especially when dealing with self-service solutions. One of the key reasons people prefer self-service solutions is that they believe more information is available online, or because they think their questions can be answered more quickly and effectively using an online channel. Ease of use. Given that portal-based interactions might seem complex and distant to some users, the ease of use of self-service solutions can be a defining criterion in establishing the overall User Experience. Depending on the types of service, ease of use is an important determinant of the perceived value of a service. Privacy and security. Both a hygiene factor as well as a differentiator for service providers, privacy and security are key evaluative criteria in the delivery of automated services. Graphic style. Various studies have found that the graphic style of online portals and websites is an important determinant in shaping the Service Perception and user experience. Graphic style involves such issues as color, layout, print size and font, number of photographs, graphics and animations. Fulfillment and reliability. The dominant dimensions in traditional service quality, namely fulfillment and reliability are also cited as important factors in perceived (automated) service value. In fact, some research found that reliability and fulfillment ratings for some User Groups form one of the strongest predictors of determining the overall User Experience. While fulfillment and reliability are primarily concerned with the core service delivery, reliability may also reflect technical reliability, such as the proper functioning of a website. With the demographic information and psychographic criteria, service providers can compose a User Characteristics Chart. If you want to download a blank User Characteristics Chart, you can download the free materials that accompany the Service Automation Framework book. 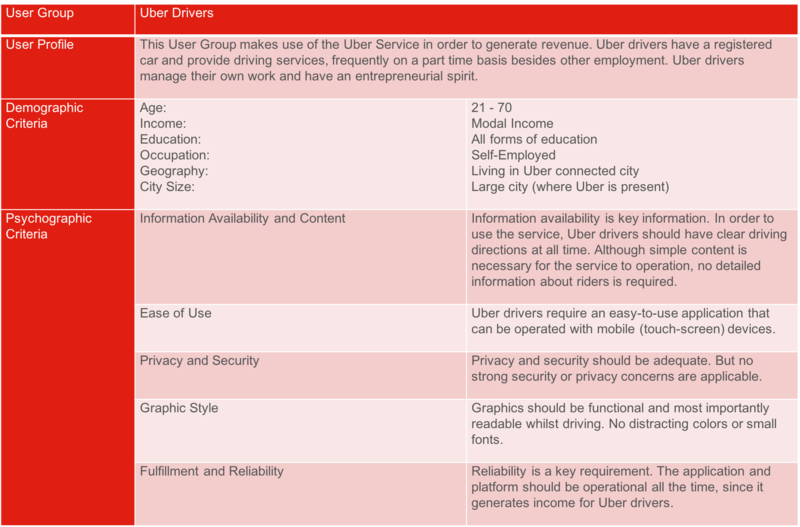 The User Characteristic Charts describes above describes a very important User Group of Uber. 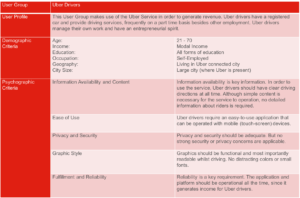 Because Uber operates a platform with two types of users (Uber drivers and Uber riders), it is important to understand the key characteristics of each group. Based on the information above, Uber needs to take different approach to service design for Uber drivers in order to achieve an optimal user experience. The User Characteristics Chart is a helpful tool to quickly identify key information about Users.